In one of the largest land transactions in history, France officially transfered the Louisiana Territory to the United States on December 20, 1803. Factors such as control of the port of Louisiana and free navigation of the Mississippi River spurred President Jefferson to broker the purchase. The U.S. gained 828, 000 square miles in the $15 million purchase (about four cents an acre), doubling the size of the nation. 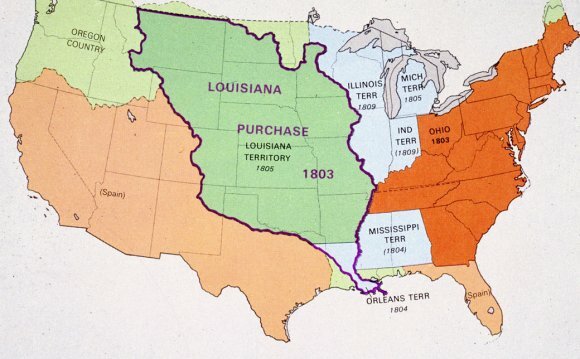 The Louisiana Purchase encompassed portions of 15 current U.S. states and 2 Canadian Provinces. The land included in the purchase comprises around 23% of the territory of the United States today. Napoleon needed money to support his European military ventures. He couldn’t afford to send sufficient troops to defend the territory, and besides, he had already lost an inordinate amount of soldiers to yellow fever while trying to suppress the Haitian rebellion. Napoleon thought he was getting the better end of the deal by selling off the mosquito-infested lands of the Louisiana Territory. Jefferson was jubilant. At one stroke the United States would double its size, an enormous tract of land would be open to settlement, and the free navigation of the Mississippi would be assured. Although the Constitution did not specifically empower the federal government to acquire new territory by treaty, Jefferson concluded that the practical benefits to the nation far outweighed the possible violation of the Constitution. The Senate concurred with this decision and voted ratification on Oct. 20, 1803. The Spanish, who had never given up physical possession of Louisiana to the French, did so in a ceremony at New Orleans on Nov. 30, 1803. In a second ceremony, on Dec. 20, 1803, the French turned Louisiana over to the United States. A few weeks after the purchase, President Thomas Jefferson, an advocate of western expansion, had Congress appropriate $2, 500 for an expedition to see just what it was the United States had just purchased. Jefferson selected Captain Meriwether Lewis to lead the expedition, and Lewis selected William Clark as his partner. U.S. presidential election, 2004 detailed results. This image shows the breakdown by county/parish.Blue for the Democratic candidate, red for the Republican candidate.